They’re kids with a cause – compassionate, creative and courageous. You see them at every grade level, students who love serving in their schools and communities. Thank them for their goodness with a Young Humanitarian Award nomination. They could win one of four $1,000 prizes. Deadline for submissions is Thursday February 28, 2019 at 4:00 pm. Join us at our MTS YHA Awards April 16, 2019, 7:00 PM at the Manitoba Theatre for Young People. Nomination forms are available here in English or French. What is a Young Humanitarian Award? YHA’s are given to students with caring hearts who are involved in good works in their schools and communities. Compassion, caring, self-sacrifice, leadership, creativity– these are the qualities we look for. And it doesn’t matter how old the student is. All Manitoba public school students from Kindergarten to Grade 12 are eligible. 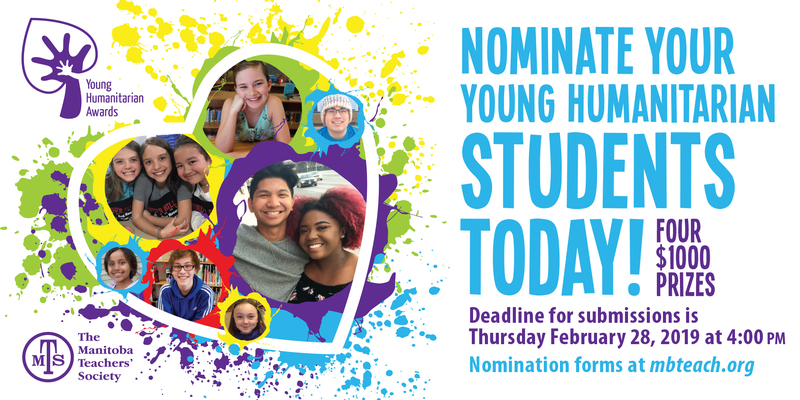 YHA winners represent hundreds of other students across the province who touch the lives of people in their schools and communities, every day. What kind of projects have won in the past? Past winners have done everything from travelling to foreign countries to dig wells, to raising money for injured friends, to helping local food banks or women’s shelters – even reading to the sick or elderly. You can find a complete list of every project we’ve ever given awards to in our Schools and Projects section and all of our winners are listed in the YHA Archives. How do I nominate a student or group of students? Everyone knows that humanitarian work is its own reward. But each year, students are grateful that someone has recognized their work with a nomination – even if they don’t win one of our major awards. If you’re a teacher or parent, you can simply download the criteria for the award and the nomination forms from this website. You cannot nominate your own child. If you’re a student, download that same information or ask your teacher to do it for you. Remember that your teacher, a member of the parent council at your school (it can’t be your mom, dad), or a charitable organization you’ve done work for, will have to sign your nomination papers. You should be keeping them up to date on your project as it progresses. If you represent a charitable organization, download the criteria and the forms. How do students know if they’ve won? After the MTS YHA committee makes its selection, it will let all the nominators know who has won. Award recipients will be informed by the nominators. Representatives from the Manitoba Teachers’ Society will usually meet with the winners and their nominators in advance to gather more information and take pictures for YHA Night. What happens at the awards ceremonies? YHA Night is a moving and inspiring evening. Nominators introduce the recipients, the recipients deliver short speeches to a packed auditorium, and we have first class entertainment by students. The whole show lasts a little over an hour and everyone stays for a big family friendly reception. It’s a time for the awards recipients and parents, aunts, uncles, teachers, principals – everyone really – to celebrate. You don’t need a ticket to get in, everyone is welcome, members of the media are usually there – and we pack the house. You can go to the MTS website or click here. If you have any specific questions that can’t be answered on the website, you can email us at yha@mbteach.org and we’d be glad to help. Also check out our Facebook fan page or sign up for our Twitter Feed.